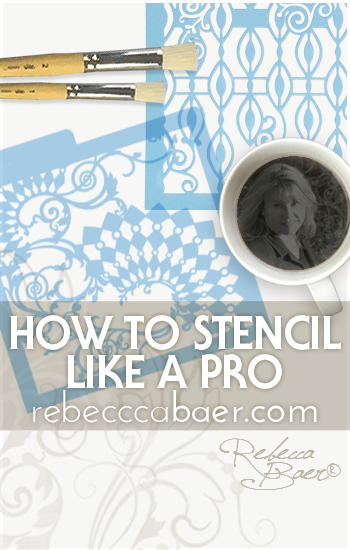 Stenciling looks so easy but perhaps you struggle with getting crisply defined edges. No one likes to sneak a peek under their stencil to see paint that has bled underneath. 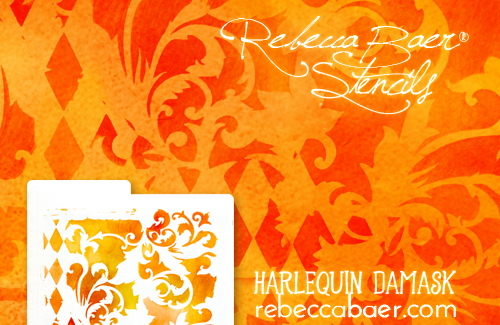 Rest assured, stenciling is easy. The secret to getting those crisp, clean motifs is a properly loaded and wiped brush. Position the stencil on the surface as desired and secure with removable tape. Mask surrounding areas and motifs with the same. Post-itTM notes are handy for quickly masking an area but could get pricey on a large project on which you might want to use other unprinted paper. Choose the largest brush that fits the space; it will minimize your work. Pick up the desired color paint on the appropriately sized stencil brush. Wipe the brush on a paper towel to remove excess paint. There should not be any visible wet paint; the bristles should look rather dry. Test the brush load by pouncing or swirling over the stencil on a sample surface. If paint seeps beneath the stencil, then you have not removed enough paint from the brush; wipe it again on a paper towel. Experiment with your stencil on the test surface until you achieve the desired appearance. Holding the brush perpendicular to the surface, pounce or gently swirl over the stencil until the design is filled in. In some cases you do not want to swirl over a stencil, such as those with intricate details, as you may lift and bend or crease the stencil, causing permanent damage. The most common problem encountered when learning to stencil is leaving too much paint in the brush, which results in messy edges. If in doubt, err on the dry side and lift a corner to take a quick peek. You can always repeat the process if the stenciling appears too faint. When your stenciled masterpiece is complete you'll want to care for your stencils properly so that they provide you with many years of use. Now that you've mastered your technique, let's get creative. The following links are to a series on using stencils effectively to create that scroll-stopping masterpiece.